We had a wonderful summer vacation in Walker, MN. 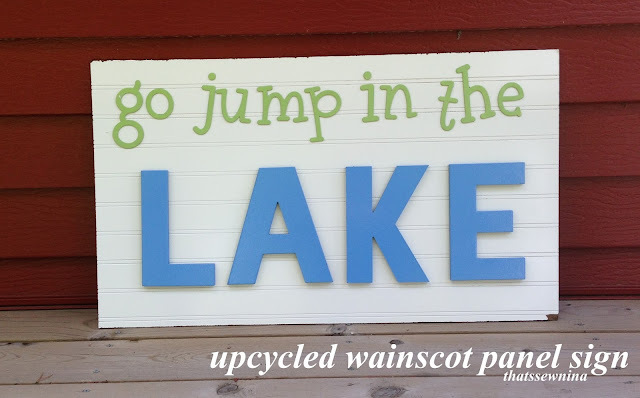 Walker is one of those adorable lakeside tourist towns in northern Minnesota. Lots of cute shops, locally owned restaurants, and antique stores! I visited one of my very favorite antique stores in Dorset, MN not too far from Walker. 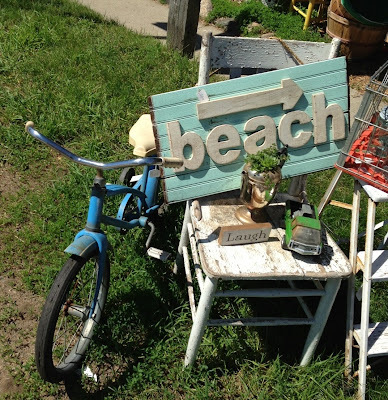 They have a bit of a shabby chic style and offer beautifully crafted items and jewelry along with traditional antiques. As I walked in I saw this awesome little "beach" sign outside of the store and inspiration struck! I had leftover paneling from our bathroom remodel so I thought, what a great idea! Everywhere I went in Walker, shops carried signs that said "go jump in the lake" so I think it would make a perfect phrase for my sign. You can find paneling at a home improvement store for $10-$15 for a 3'x4' piece or maybe try a thrift store that carries reuseable building supplies. We have one in Moorhead called ReStore that supports Habitat for Humanity. Rip down a piece of wainscot paneling to the size you like. I happened to have the perfect size piece but I used a circular saw to cut another piece for a different sign. Spray paint the letters and board in the colors you want. Place the letters and hot glue them to the sign. That's pretty much it! *TIP! I used both spray paint from a craft store and some from a hardware store. Definitely go for the hardware store brands if you can! They were cheaper, higher quality and I was so surprised at the variety of colors I could find there!